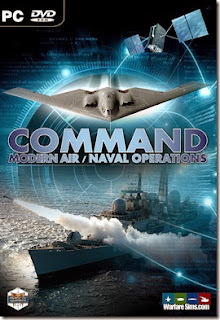 This past fall Warfare Sims Ltd. released the long awaited modern wargame simulation Command: Modern Air/Naval Operations. I was very fortunate to participate in some of the beta testing, unfortunately I was so busy with work and family that I didn't get to play it nearly as much as I would have liked. Finally I was able to sit down, play a simulation, and do an after action report. 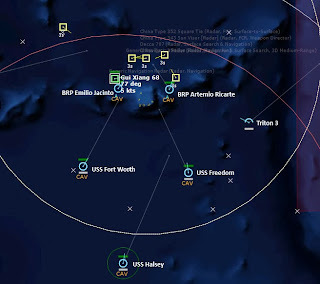 The scenario I chose is called "South China Clash", and features the US Navy coming to the aid the Philippines against the Chinese in the contentious South China Sea. As China rises it has begun to press longstanding maritime claims with the hopes of rolling back potential adversaries farther from its shores, opening up Chinese industry to new opportunities and securing the sea lines of communication to the natural resources its booming industry requires. It is strategy borne on the notion that the PLAN [People's Liberation Army Navy] vastly outclasses most nations in the region and that the United States will never risk war or economic disaster over a small maritime claim. The question is... does the U.S. think the same of China? Scarborough Shoal or Huangyan Island is a small group of islands, reefs and rocks around 123 miles from Subic Bay. Sparsely populated and of marginal value to the fishing industry, its ownership is contested by the Philippines and the People’s Republic of China. China has begun more recently sending Coast Guard vessels along with its fishing fleet to protect its interests. With the U.S. forces on the not so distant horizon the Philippine Navy may feel empowered to act. Several days ago the People's Republic of China announced their intention to send a flotilla of fishing vessels to the area of Huangyan Island and asked that all foreign vessels not interfere with the flotilla’s activities. 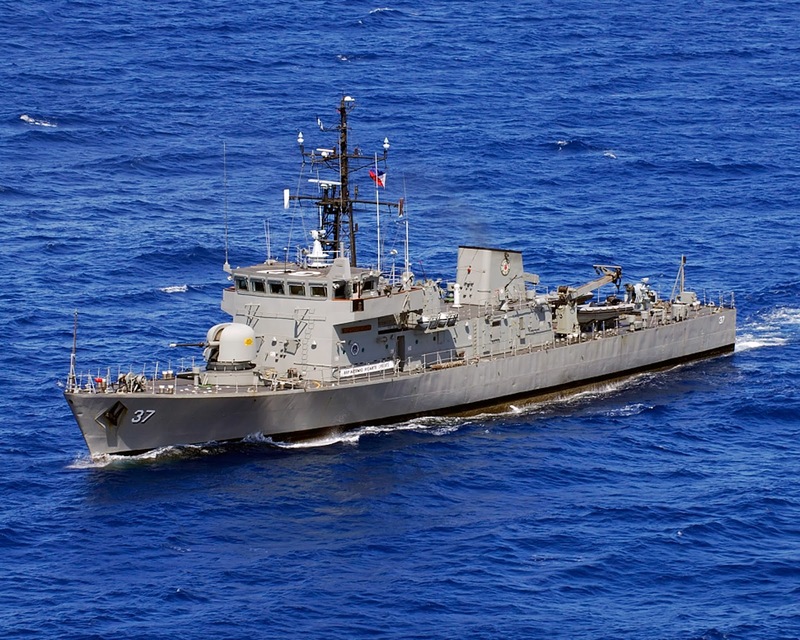 It added that it was dispatching a Coast Guard frigate to ensure the fleet’s safety. The Philippines in kind replied that it was tasking patrol vessels to the region and that its territorial integrity must be respected. The US state department reiterated the US commitment to ensuring regional stability and the security of its allies. In response China has moved a stronger PLAN force into the region. 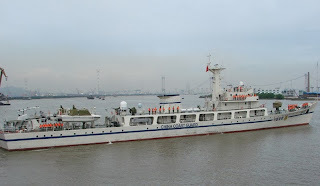 The Chinese fishing flotilla is escorted by a lone CCG [Chinese Coast Guard] Jianghu frigate. 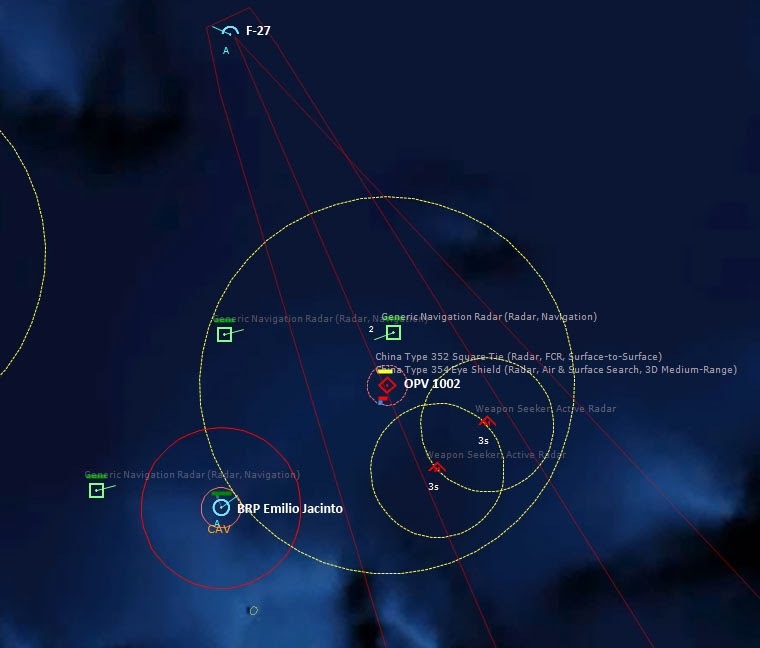 A strong PLAN task group consisting of a Type 52C Luyang II destroyer, two Type 54A Jiangkai II frigates and a single Type 56 Jiangdao corvette has been detected east of the Paracels moving east. (Last known position marked as PLAN SAG). Numerous PLAN submarines are known to be at sea. 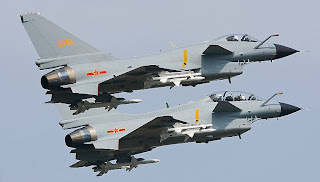 PLAN and PLAAF [People's Liberation Army Air Force] air assets are operating from Woody Island in the Paracels and Hainan Island. 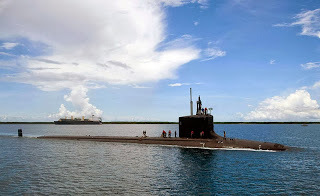 My surface assets consist of two LCS (Littoral Combat Ships), USS Freedom (LCS-1) and USS Fort Worth (LCS-3), one Arleigh Burke-class destroyer, USS Halsey (DDG-97), and the Virginia-class attack submarine USS Hawaii (SSN-776). Freedom and Fort Worth don't have much in the way of offensive weaponry that I can see being useful here, and Halsey is a Flight IIA ship, which means it has hangars for ASW aircraft (2 MH-60R Seahawks), but it lacks Harpoon missile launchers. That is worrisome--my primary surface combatant's only weapon against surface threats is its 5" gun. 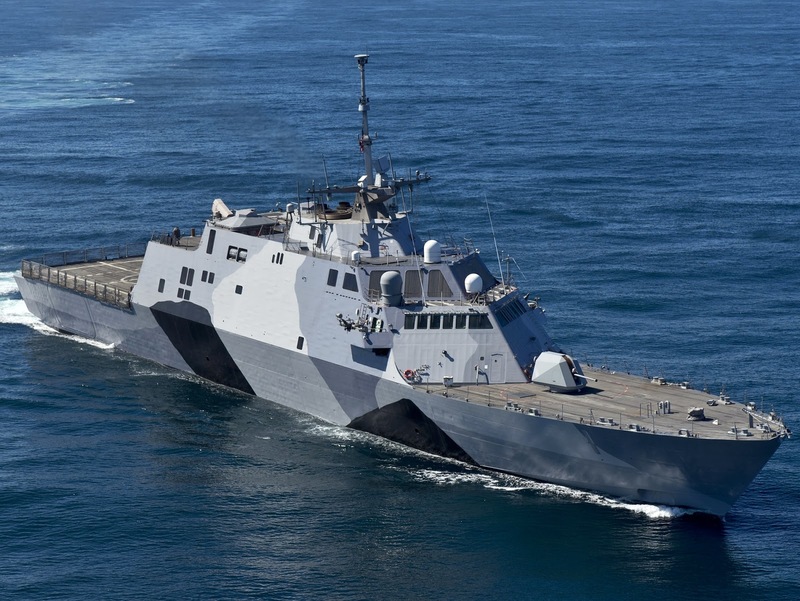 True, the Seahawks can fire Hellfire missiles, and the Halsey can use some of its SAMs in an anti-ship role, but neither option is very appealing. So that leaves Hawaii, and that makes up for a lot. Hawaii of one of the most modern submarines in the US Navy, and it can sink anything afloat. 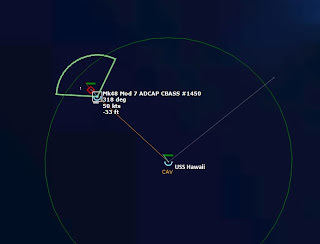 For air assets I have various patrol aircraft, including P-3C Orions, and P-8A Poseidons, and more importantly, my primary reconnaissance aircraft, several MQ-4C Triton UAVs based on Guam. 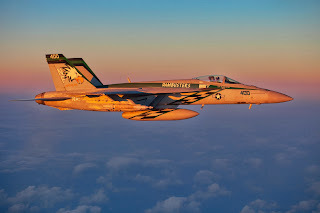 My ace in the hole, however, is a squadron of 12 F/A18E Super Hornets from VFA-195 Dambusters, located at Singapore. I have a few KC-135R Stratotankers on station for in-flight refueling. Those Super Hornets will be my primary ASuW (anti-surface warfare) punch against the Chinese. 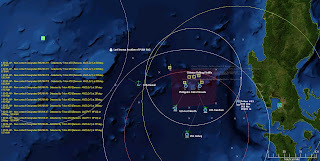 You are to use the forces in the region to best position Philippine Naval forces to challenge any naval incursion by the People’s Republic of China. If a conflict does erupt you are to destroy all hostile forces at no loss to your own. 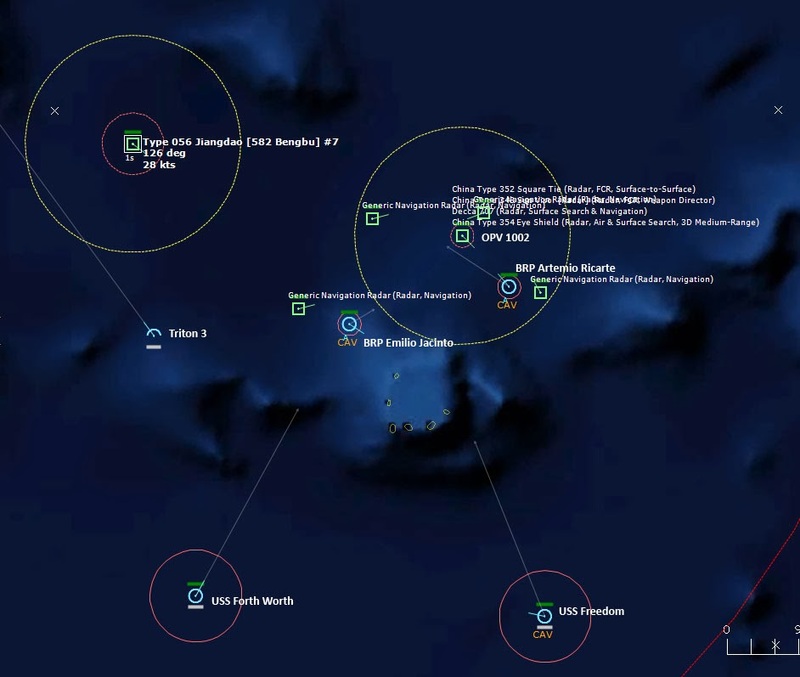 I set up various patrols, and the my surveillance UAV, Triton 3, detects multiple contacts all around the Scarborough Shoals. 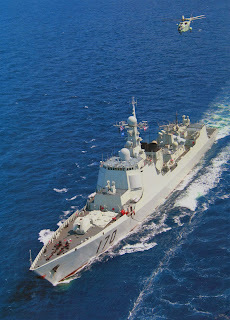 Most of them must be the Chinese fishing flotilla, but undoubtedly one of them is the Chinese Jianghu frigate. One of the tracks, Skunk 6, is classified as a FFG, so that must be it. 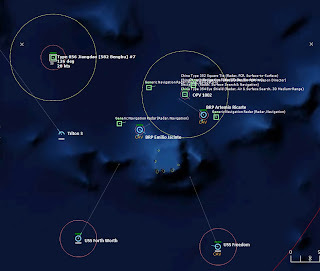 Most of my ships are south or southwest of the Scarborough Shoals, while the Philippines have a pair of patrol vessels, BRP Emilio Jacinto and BRP Artemio Ricarte, in the thick of it, very close to the Chinese fishing flotilla. 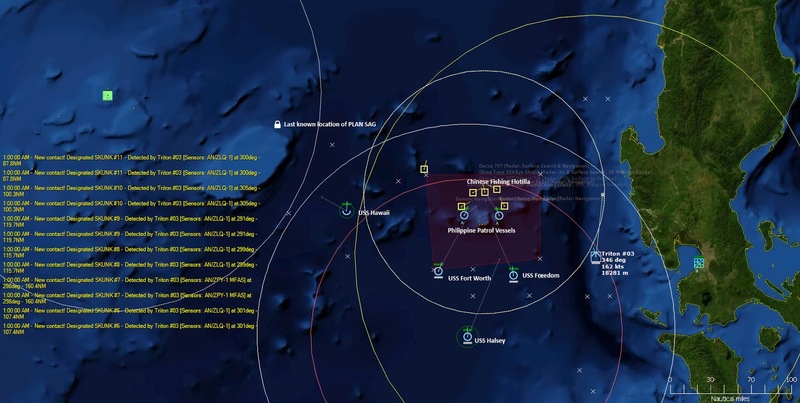 The Philippine patrol vessels alter course for Skunk 6, and so a confrontation looks inevitable. 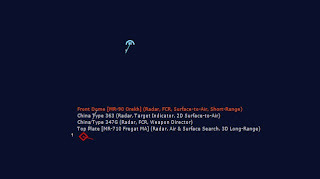 Within minutes one of the surface contacts is positively identified as a civilian, the Gui Xiang 68. 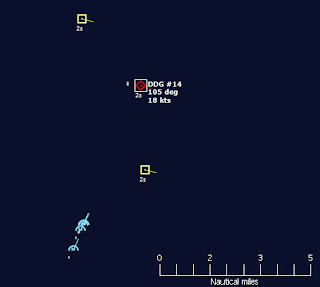 Skunk 7, to the northwest, is traveling at 28 knots, and is likely a member of the Chinese SAG [Surface Action Group]. 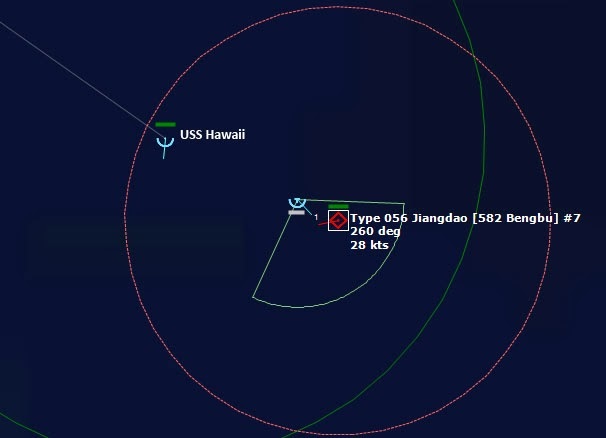 USS Hawaii is tasked to intercept. 01:09:27 The second fishing vessel is positively identified. 01:12:15 Triton 3 has identified the FFG as a Type 053H Jianghu I [509 Changde] #6 It is the Chinese Coast Guard OPV [Ocean Patrol Vessel] 1002. A new surface contact is also detected far to the northwest. 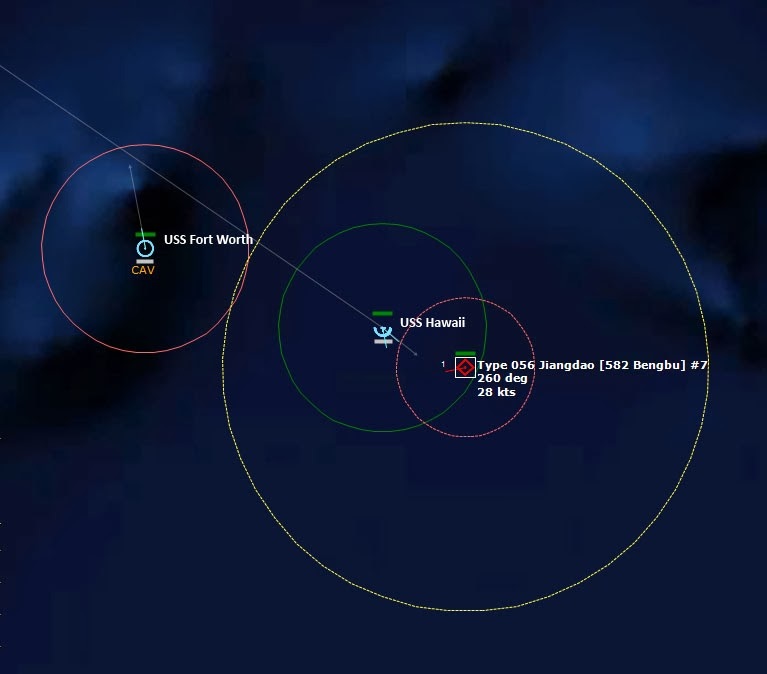 01:13:30 Triton 3 detects three more contacts, right where the SAG is supposed to be. 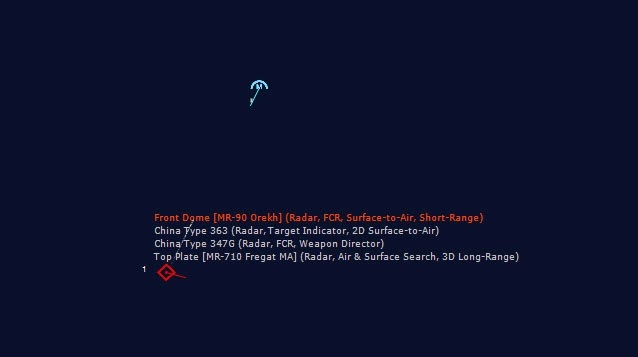 01:29:29 Triton 3 detects a Bogey operating near Hainan while maneuvering closer to Skunk 7, probably a Chinese patrol craft. In the meantime, BRP Artemio Ricarte and the OPV 1002 are closing on each other at a combined speed of 50 kts, and are less than 12nm apart. The Filipinos do not seem like they will back down. 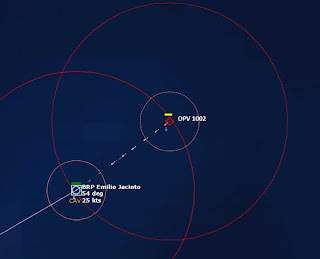 This is a dangerous move, however, as the Chinese Coast Guard vessel outguns the Filipino patrol vessel: the Emilio Jacinto and the Artemio Ricarte both have 76mm guns as their primary armament, while the OPV 1002 has a 100mm gun, and anti-ship missiles. 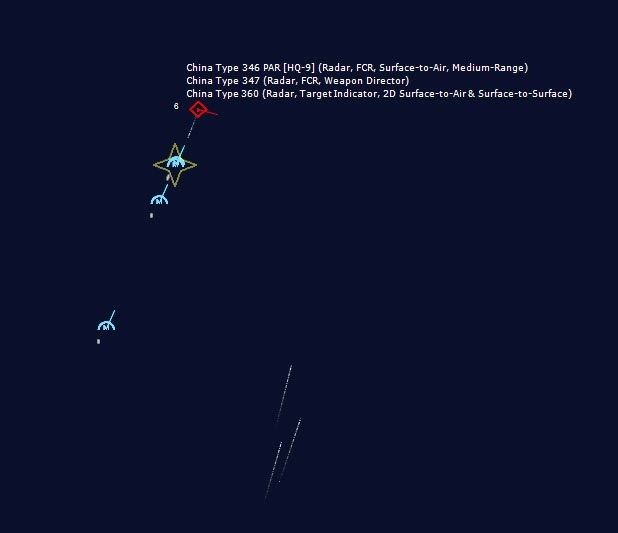 01:33:05 Skunk 7 is positively identified as a Type 056 Jiangdao [582 Bengbu] #7, which is probably detached from the SAG. Which implies that the SAG main force consists of the Type 52C Luyang II destroyer and two Type 54A Jiangkai II frigates. 01:36:55 Things get real. BRP Artemio Ricarte and OPV 1002 close to within six miles, and shots are fired. 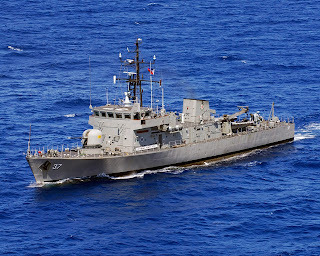 01:37:19 BRP Artemio Ricarte has suffered damage from the OPV 1002's 100mm guns, and is on fire. 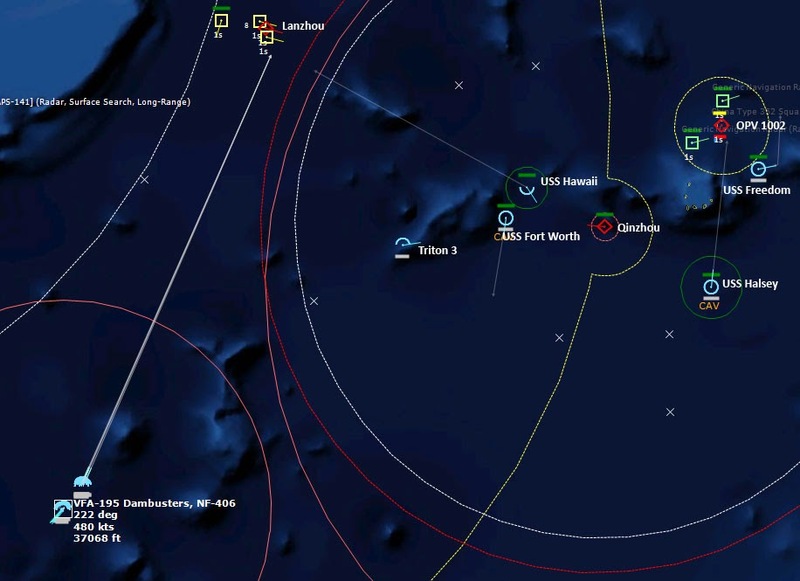 All Chinese vessels are now determined to be hostile. 01:38:26 BRP Artemio Ricarte suffers more damage from the OPV 1002, including losing its 76mm gun mount, so now the 1002 can pound the Ricarte with impunity. Before falling silent, however, the Ricarte did some damage to its foe. As the last shots hit home, the 1002’s 100mm gun falls silent, and its speed drops to 0 kts. Perhaps it was more damaged than first thought. 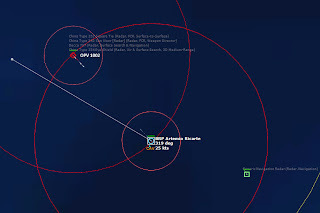 01:40:52 A Philippine Patrol aircraft in the area, an F-27 Friendship turboprop, detects two Vampires [missiles], possibly launched from the 1002. Soon after, the 1002 resumes firing its 100mm gun at the Ricarte. 01:41:50 The Vampire contacts are lost...and the fishing vessel Yue Yang Jiang 98135 is lost as well. Did the OPV 1002 just shoot at one of its own fishing vessels? 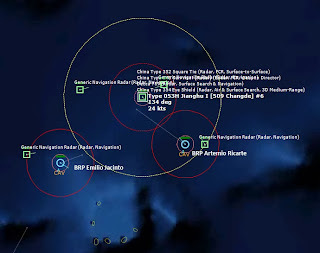 01:42:34 The BRP Artemio Ricarte is apparently hit with a YJ-83 anti-ship missile, and just like that, it vanishes. 01:45:24 The F-27 detects two more Vampires. What’s the target? Based on the angle, it looks like the 1002 might be firing at another commercial fishing boat. 01:45:54 Sure enough, that’s what happened. 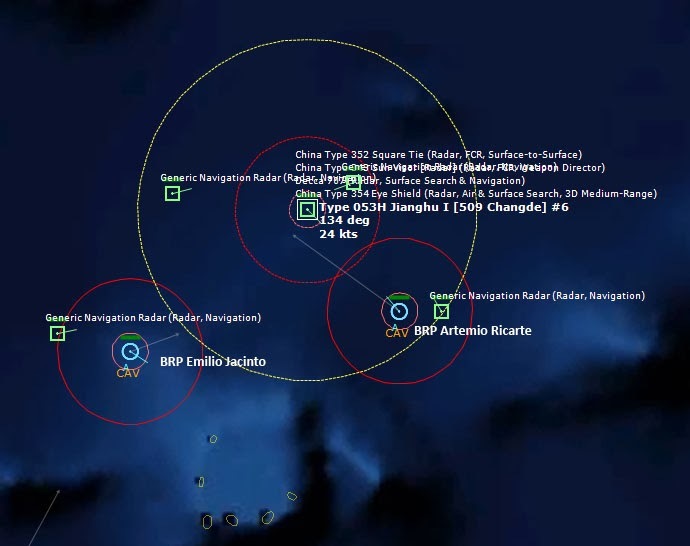 Two CSS-N-8 Saccades hit the Commercial Fishing Vessel Yuejiang Cheng 96199, sinking it. 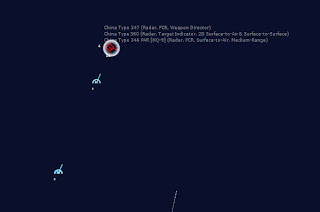 A Chinese Coast Guard ship shooting at the very vessels it was supposed to protect... Either this was a mistake, and the 1002 was shooting blind, or something more nefarious is at work--China is sinking their own civilian vessels with the intent of blaming it on the Philippines or the U.S. Would the Chinese really stoop that low? 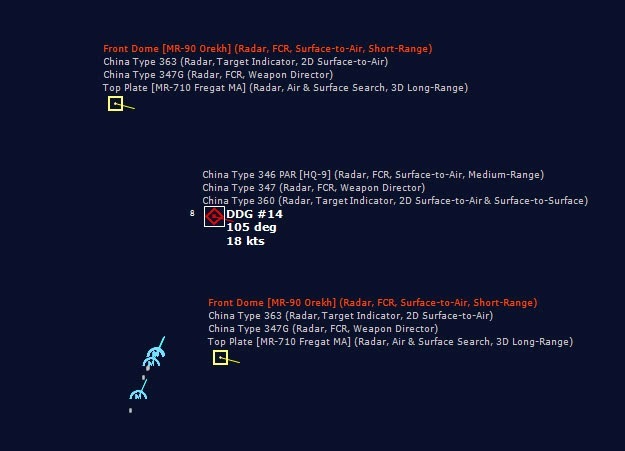 02:04:13 The F-27 closes enough with the PLAN SAG to detect that the center target is in fact a DDG, undoubtedly the Lanzhou-class destroyer. Soon after, the F-27 is shot down by a pair of missiles launched from the destroyer. Triton 3 must exercise caution lest it suffer the same fate. With the Lanzhou identified, it’s time to launch an airstrike. A strike package from VFA-195 Dambusters, consisting of 8 F/A-18Es based at Singapore prepares to launch. Half are armed with AGM-88C HARMs, while the other half are armed with AGM-84K Harpoons. 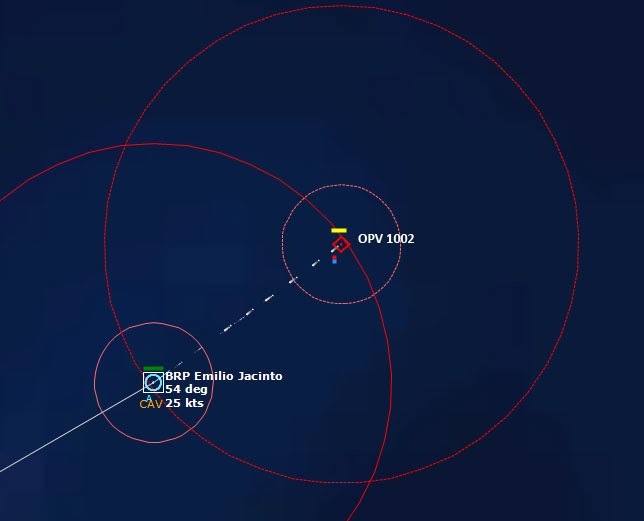 02:08:47 BRP Emilio Jacinto closes to within gun range of OPV 1002, and both vessels open fire. Emilio Jacinto is outgunned, but 1002 is damaged and on fire, so perhaps the odds will be even this time. 02:12:39 BRP Emilio Jacinto manages to score some hits, but it is heavily damaged by 1002, and Emilio Jacinto is on fire and flooding. Despite the heavy damage and zero functioning weapons, Emilio Jacinto closes the range as fast as it can, only to be pounded by the 1002 until it sinks. 03:12:41 A Maritime Patrol Aircraft to the north is identified as a Chinese Y-8X Cub, and it comes into range of USS Halsey, which fires a pair of RIM-174A ERAM SM-6MR Blk Is at it, and two minutes later, the missiles hit their target and destroy it. 04:28:44 The Dambusters launch their eight Harpoons at the Lanzhou-class destroyer. 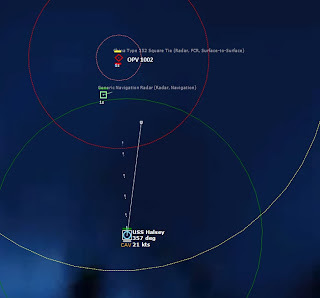 04:43:21 The Chinese detect the inbounds, and their radars light up. The lead missile is a mere 2.57nm away. Is it too late? 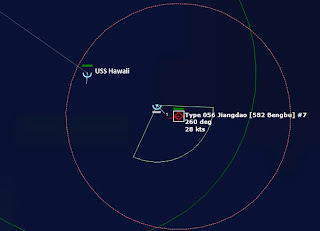 04:43:36 The Lanzhou-class destroyer shoots down two of the Harpoons with its 30mm CIWS [Close-In Weapon System]. 04:43:38 The Lanzhou-class destroyer Haikou is hit by two Harpoons. Seconds later, a third hits, and the Haikou explodes. 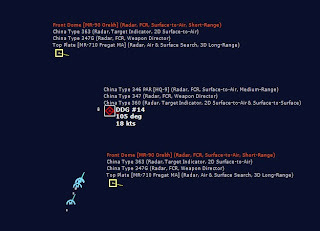 04:43:55 The last Harpoon executes a U-turn and heads for one of the frigates, the Type 054A Jiangkai II [530 Xuzhou], but the Xuzhou shoots it down with its 30mm CIWS. Soon after, one of the Dambusters shoots down a Y-8X that wanders too close to the flight. 04:48:47 The second flight of Dambusters unleashes their AGM-88C HARMs at the PLAN frigates. 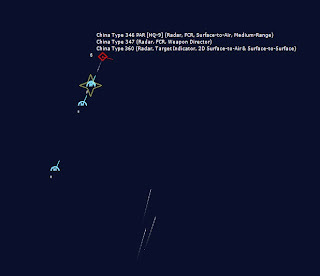 Two of the HARMs impact the Xuzhou, one misses by 18m, while the remaining 5 are shot down by SA-N-12 Grizzlies launched from the two frigates. 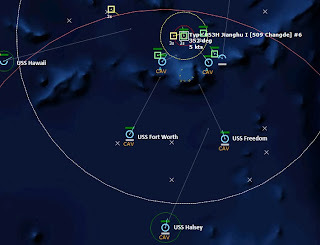 05:03:41 In the meantime, USS Fort Worth has been luring the Type 056 Jiangdao [582 Bengbu-class corvette Qinzhou] towards the USS Hawaii’s patrol zone, and the Hawaii maneuvers into torpedo range. Torpedo in the water! 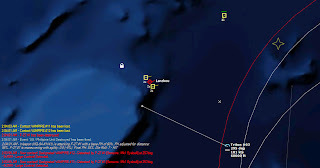 05:04:41 Contact with 530 Xuzhou is lost, which is strange, since it was only hit by two HARMs, which do not have very large warheads. The HARM is designed to take out radar systems, but if it sunk a ship, I won't complain. 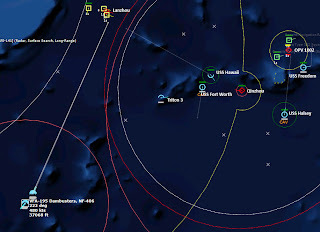 05:07:26 The Qinzhou appears oblivious to the incoming torpedo, but since it is traveling at 28kts in an attempt to catch the speedy USS Fort Worth, its sonar likely can't pick up a thing. The corvette is doomed. 05:08:05 The torpedo hits, and the Qinzhou immediately begins to lose way. 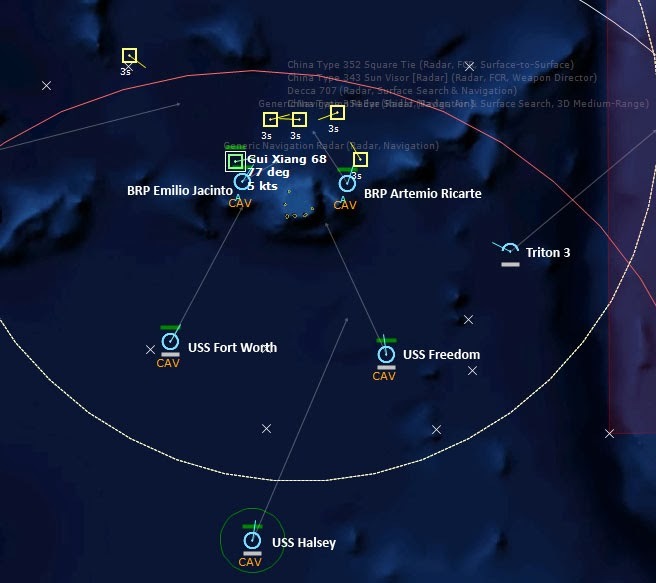 USS Hawaii launches another torpedo to make sure, but before it gets there, the Qinzhou sinks. 06:14:45 USS Halsey finally gets within gun range of the 1002, and opens fire with its 5” gun. 06:16:32 While the Halsey pounds 1002, something managed to shoot down Triton 3...but nothing shows up on the plot. Perhaps it was the last Chinese frigate? Soon it becomes clear. 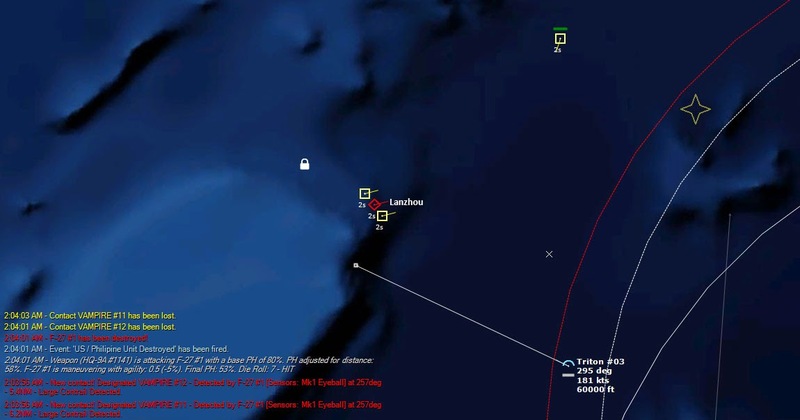 Two J-10AH Vigorous Dragons are detected by the Halsey in the vicinity of where Triton 3 was shot down. 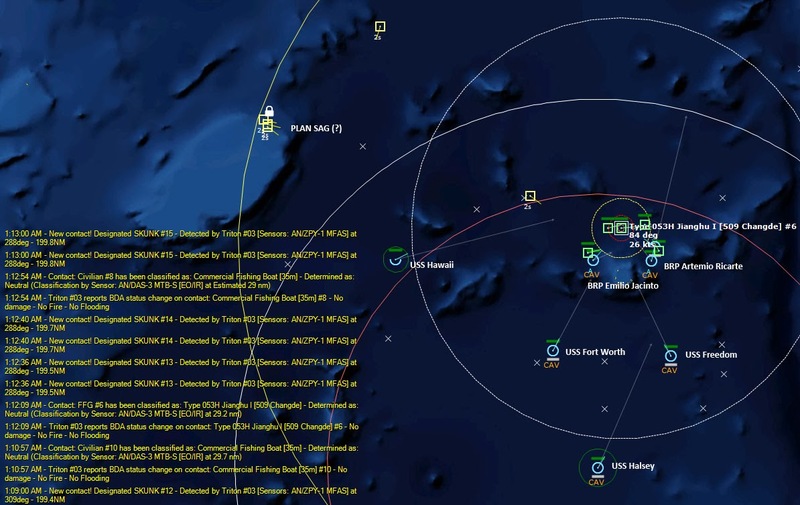 The two fighters are too far away for the Halsey to engage with any chance of success, so the Halsey retaliates instead by unleashing salvos of Tomahawk cruise missiles are every Chinese base in sight. 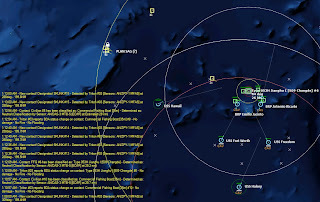 Tomahawk salvos are fired at Woody Island Airport, a SIGINT [Signals Intelligence] site and a Radar site at the island, as well as at the Yaxian-Sanya and Jialiaishi Airbases on Hainan. OPV 1002 finally disappears off the plot, and the Halsey is free to engage another target, so it sets a course for the last Chinese frigate. 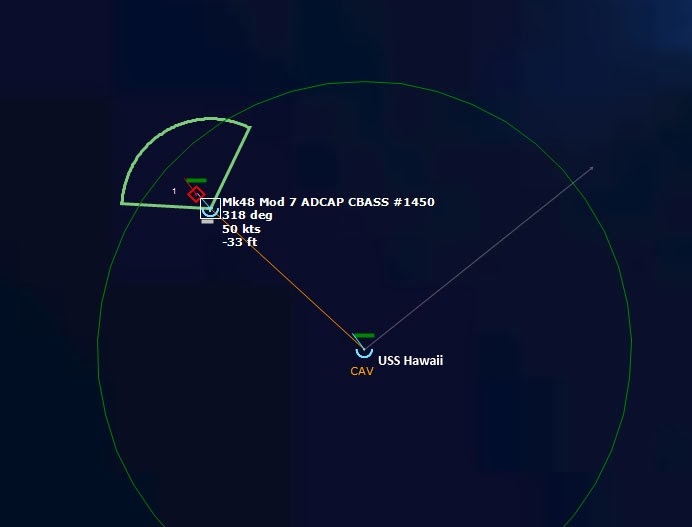 08:23:47 The USS Hawaii closes to within torpedo range of the last frigate, and launches a Mk48 Mod 7 ADCAP CBASS at it. This time the Chinese vessel detects it, and turns tail and runs. Nothing doing. The Mk48 chases down the frigate, stopping it dead in the water. A second Mk48 acts as insurance, and the frigate is destroyed. With all the surface threats eliminated, the US forces go into ASW [Anti-Submarine Warfare] mode. 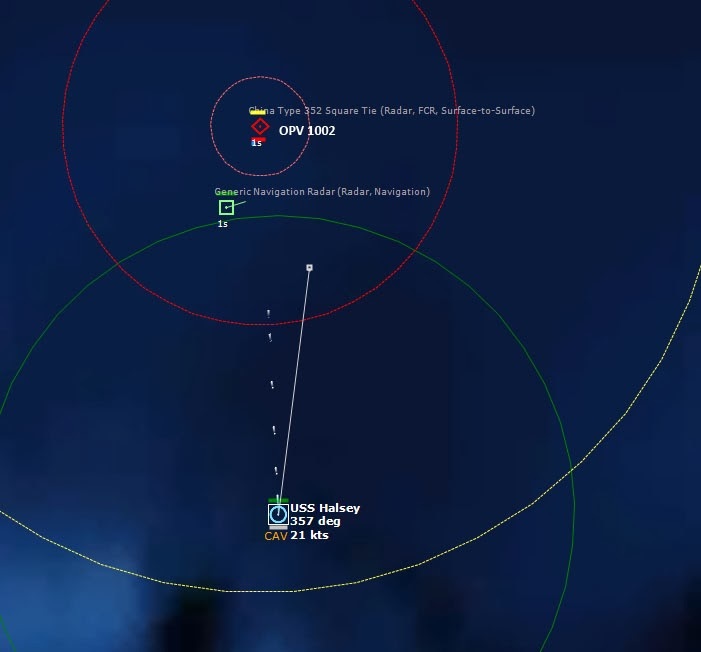 Patrols of P-3 Orions are set up, and the Halsey's helos are sent on patrol. 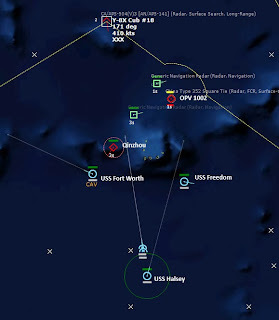 23:22:50 Hours later, a Chinese Type 041 Yuan submarine is discovered by an MH-60R Seahawk from the Halsey, and a P-3 Orion from the VP-40 Fighting Marlins sinks it. Time runs out in the scenario, and US forces are fimly in control of the area. Now it's time for the politicians to sort out the aftermath. The mission was a lot of fun to play, and I had to be resourceful. 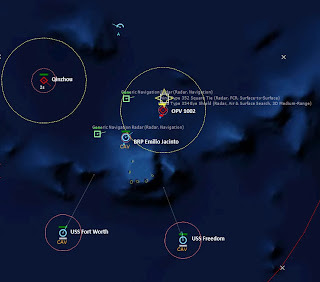 I don't see how I could have saved the two Philippine vessels, as my air assets were too far away to do anything, and my surface assets didn't have the right (or enough) armaments to assist. In fact, that was something of a shock--it seems that the US Navy these days really relies on aircraft or submarines to take out enemy ships. 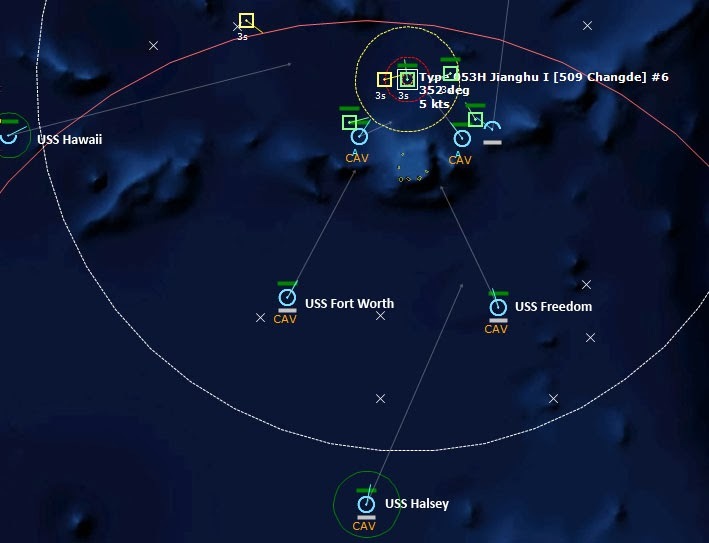 The two LCSs did not do much, other than Fort Worth luring the Chinese corvette into range of the Hawaii. The LCS did not seem of much use in this scenario, but then again, it's a Littoral Combat Ship, not a blue-water ship. The Triton was an excellent asset to have watching over everything, although not quite as good as an AWACS, since it did not detect its killers until it was too late. However, since the Triton is a UAV, I lost no personnel when it was destroyed. I really liked the in-flight refueling in Command, as having to do it manually in the old Harpoon games was a chore. 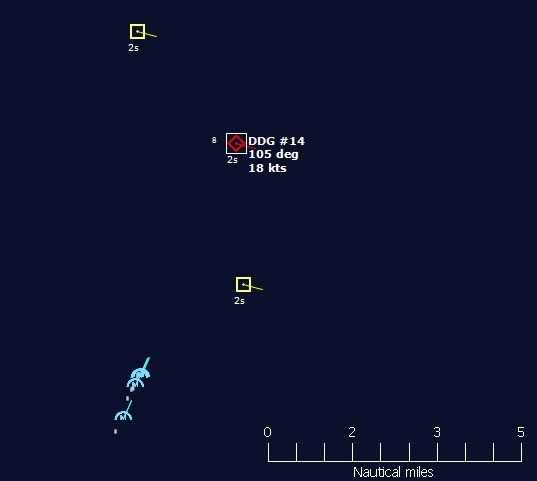 In command, as my F/A-18s got low on flew, they automatically diverted to the waiting Stratotankers and fueled without me having to pay them any attention. 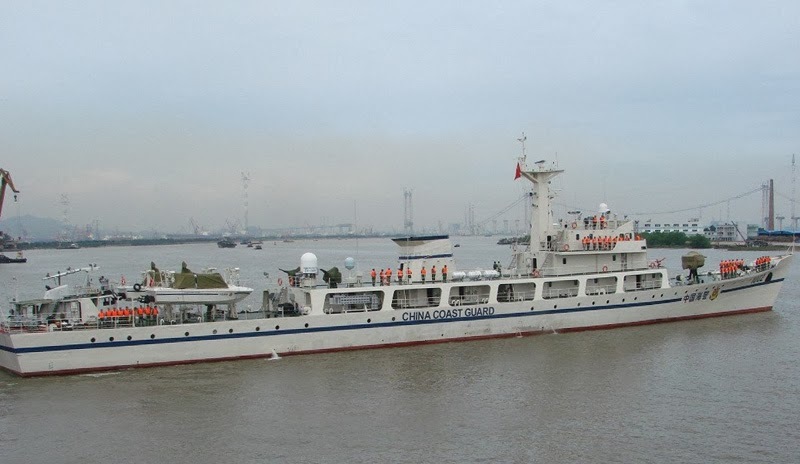 It really surprised me when the Chinese Coast Guard vessel fired anti-ship missiles at the fishing vessels. I'm not sure if it was a bug or intentional. Perhaps all the missiles were intended for the Artemio Ricarte, and some missed, then went for the nearest target? 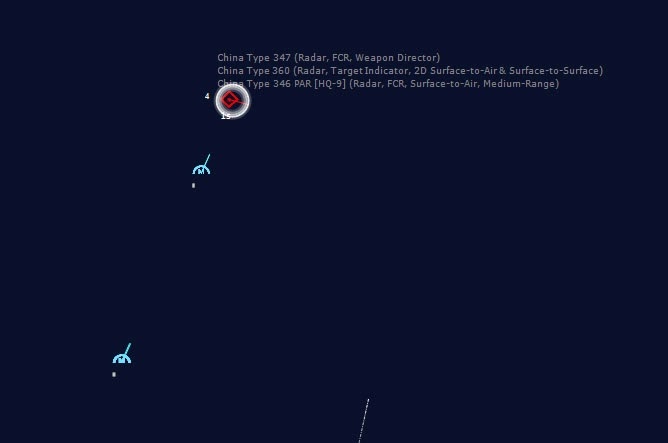 The Chinese surface action group really did little, and proved very vulnerable to the airstrike, despite the Lanzhou-class destroyer being a long range air defense ship. I would have figured that if it knew it was under surveillance by the Triton, it would have lit off its radars for self defense. By staying passive it seemed to be asking to be shot at. And then when it was, its response was too little, too late. Command is definitely a thinking man's simulation (it's too cool to call it a "game"). You can just jump into a scenario and start playing, but it you do that you're asking for trouble. 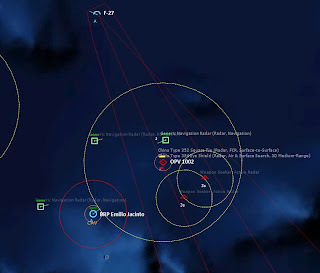 Command rewards the prepared player, who studies the mission objectives, assets, and threats carefully. Playing to win forces you to think like a commander, methodically planning your missions to accomplish your objectives, and how best to deal with the obstacles in your way. If you don't research the capabilities of your assets (e.g., "What do you mean my Aegis destroyer doesn't have Harpoons? Oh, right, it's a Flight IIA Arleigh Burke, not a Flight I...crap") and those of your adversaries, you can be in for some nasty surprises. Command is a game that's not only fun to play, it's fun to think about when you aren't playing it. You'll be replaying the mission in your head afterwards, or planning the next one. And you'll learn something about modern air/naval warfare as well.